Metaphorically speaking, Smith Center - the space and the work that happens within it – can be described as an alchemical vessel. People bring their most challenging burdens, fears, and pains to be transformed and in this place of holding. Smith Center’s deep, holistic programs—such as therapeutic creativity programs, yoga, and immersion retreats—help transform those toxic elements into hope, light, wisdom and strength. Healing is often that of transforming suffering into meaning, and art is one of the many tools that are available to aid in this process. As local artists transform the commonplace object of a bowl into an alchemical vessel, they will indirectly illustrateSmith Center’s transformative work within the community and engage participants in the healing power of the arts. Rather than merely decorating the bowls, each artist will be asked to answer the profound question of what it means to transform poison into medicine, or pain into wisdom. Thus, the exhibition’s 125 expressive responses will hang as a community dialogue on healing and transformation through the arts. In addition to viewing the exhibition from April 26-June 7, the community is invited to purchase tickets to attend a special benefit event on Friday, May 17 from 7-9 pm. This reception will offer the public the opportunity to claim one of the 125 unique pieces for their own collection—with the purchase of their benefit ticket. These tickets, which are priced at $125, will go on sale at 10 am on Tuesday, March 26. On the evening of the benefit, each ticket holder will select a vessel to take home after the exhibition closes. Priority will be given by the order in which the tickets were purchased, so the first to buy a ticket will be awarded the first pick, and so on. A $50 ticket will also be made available for supporters who would like to attend but are not interested in owning a work of art. 100% of proceeds from ticket sales will go to support Smith Center’s programs for people living with or recovering from cancer. In May 2008, Smith Center expanded by opening the Joan Hisaoka Healing Arts Gallery to advance the understanding and utilization of the arts to build, unite, inspire, and heal our communities. The gallery is the first professional, nonprofit gallery dedicated to promoting the innate connection between healing and creativity. Each year, the gallery hosts six exhibitions featuring contemporary, award-winning artists addressing significant themes, such as social change, multiculturalism, health, identity and community, to name a few. On average, each opening exhibition reception welcomes over 225 visitors, and each show receives over 700 visitors. In 2011, Smith Center initiated The 9/11 Arts Project -- a successful city-wide response to the 10th anniversary of 9/11 that engaged over 30 community partners in dialogues about leveraging the power of the arts throughout the healing process. Critical Exposure is a non-profit organization that empowers low-income D.C. youth to use photography as a tool to create social change in their schools and communities. This exhibit is Critical Exposure's annual opportunity to showcase the best student photography, writing, and social change initiative from this year. "Drink to me, drink to my health, you know I can't drink any more," the exhibition will include the viewpoints of 22 artists on Picasso himself and his work. The exhibition's timing coincides with the 40th anniversary of Picasso's death. Contemporary Artist Views of Picasso, 40 Years Later. Image: Anne Marchand, Blue Curtain, 48 x 24"
The Northern Virginia Fine Arts Association (NVFAA) announces an exhibition of paintings by Mary Margaret Pipkin. The show will run through May 26 in the Athenaeum Gallery in Old Town Alexandria. The public is invited to an opening reception on Sunday, April 14 from 4 to 6 pm (free). 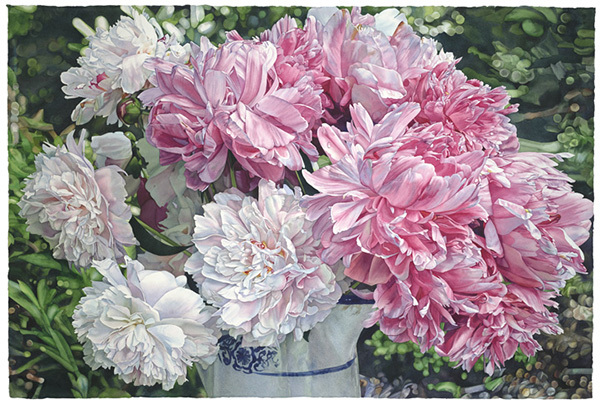 Mary Margaret Pipkin, Peonies from the Garden, watercolor, 52 x 71"
Pipkin demonstrates mastery of her medium of choice - watercolor - in her oversized works of trees and flowers that are meticulous and accurate in detail, yet artful in scale and composition. Her work has been featured in one-person shows across the country, including the U.S.Botanic Garden in Washington, D.C., the Museum of Arts and Sciences in Daytona Beach, the Olbrich Botanical Garden in Madison, Wisconsin, The Museum of the Southwest in Midland, Texas, and the San Angelo Museum of Fine Arts. Her work is included in the collections of the Smithsonian Museum, the U.S. Botanic Garden, the Washington Post, The National Institutes of Health, and Fannie Mae Corporation. 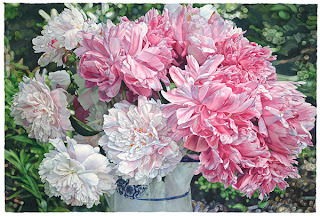 The Athenaeum scheduled the exhibition of these glorious floral works to leverage the interest and popularity of the Old Town Alexandria Historic Home and Garden tour in the neighborhood on Saturday, April 20. Open on Thursday, Friday and Sunday from 12 to 4 pm, and Saturdays from 1 to 4 pm. The Athenaeum is closed on holidays. Admission is free. A great essay by Dr. Claudia Rousseau about the work of Freya Grand for the current exhibit at the National Museum of Women in the Arts [in two parts]. Washington Artist Angela White is offering encaustic painting workshops at CAN- Capital Arts Network in Rockville, MD. This workshop is for some who have little familiarity and some who have experienced working with the medium, but seek to refine their skills. Diversity of learning is covered, including the basic materials and techniques, safety issues and discussions of supports, grounds, layering, scraping, fusing, transparencies, collage, image transfer, including combination with oil and other media. One on One Encaustic Painting Works in Angela White's studio at $50 an hour. Interested people may contact Angela White to create a schedule that works. Email Angela White for a list of required and suggested materials and more information on what is included in the workshops.